It is manufactured by imported corrosion-resistant plate with advanced technics. 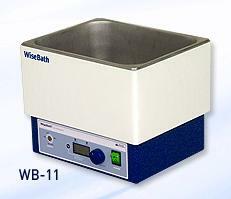 Waterbath WB-11 ini banyak digunakan pada lab Biotechnology, Clinical, Environmental, Medical, Petroleum, Pharmaceutical dan Industrial Applications. Digital Fuzzy Controller Implementing Maximum Temp. Accuracy. Stainless Steel Bath for Superior Durability High Thermal Efficiency. 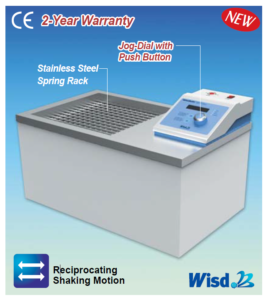 Stainless Steel Lid prevents Evaporation and keeps Constant Temperature. Over Temperature & Over Current Protection, Sensor Error Detection. Digital Timer Function(99hr 59min) : ‘Delay Time’ and ‘Operation Time’ can be controlled. Storage function for the Set Values of Temperature and Timer. Alarm function : Error Status and Timer-end. 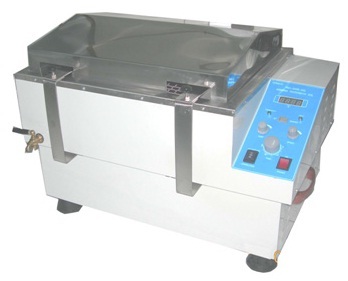 Include : Dome Lid, BFC 111 Stailess Steel Lid with 2 Sets of concentric ring cover, test tube rack 63 holes dia. 17mm. Stainless Steel Bath for Superior Durability & High Thermal Efficiency. Universal Rack included : for 50 ~ 2000 ml Flasks /Tubes. Digital LCD with Back-Light Function.